Strarting from version 9, Parallels Desktop for Mac Business Edition allows you to run a virtual machine in a server role. It means that Parallels Desktop Business Edition can be run as a service (background process) without a graphical user interface. The virtual machines also run in the background with no virtual machine window displayed on the OS X desktop. When configured to run as a service, Parallels Desktop and the virtual machines start automatically when OS X starts without requiring a user to be logged in to OS X. You can have a high performance Mac running multiple virtual machines in the background to which users can connect remotely via VNC, RDP, SSH, and other remote tools. Open Parallels Desktop and click Parallels Desktop > Preferences in the menu bar. Then click General and select the Start Parallels Desktop as a service option. Select the Disable Resume for Parallels Desktop option to ensure your virtual machine does not get stopped or suspended when you close Parallels Desktop but it continues running or gets shut down according to its startup and shutdown settings, which is essential for a server mode. In the virtual machine menu bar, click Actions and then click Configure. Click Options and then select Startup and Shutdown. In the Start Automatically menu, select When Mac starts. 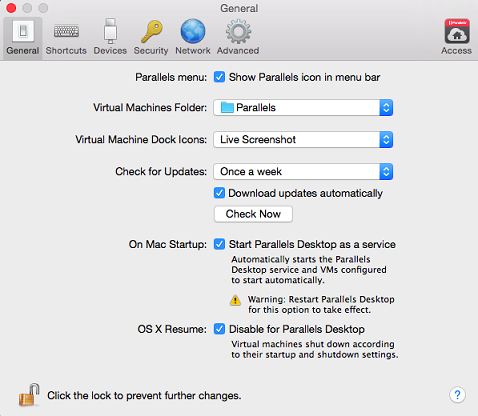 Now Parallels Desktop service and your virtual machine will start automatically after Mac OS X boot. In the On Mac Shutdown menu, select Suspend. This tells the Parallels Desktop service to suspend the virtual machine when the Mac is shut down or restarted. In the On Windows Close menu, select Keep running in background (or Ask me what to do if you want a dialog displayed when you close the virtual machine window). This way the virtual machine will not be accidentally shut down or suspended when you open and close its window while Parallels Desktop is running as a service. Set the rest of the options according to your usual preferences. 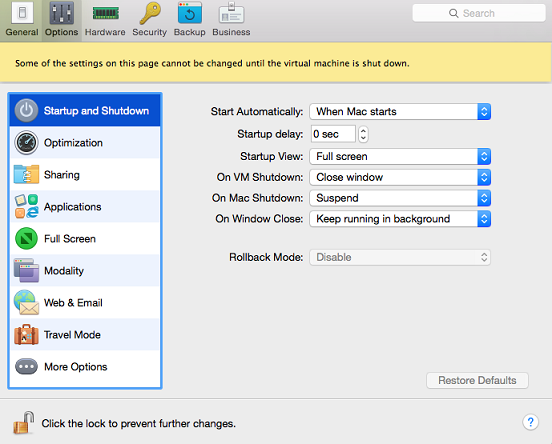 Close the virtual machine preferences window and start the virtual machine. You may now close the virtual machine window and the Parallels Desktop application. This will only close the graphical user interface. The Parallels Desktop service and the virtual machines will continue to run in the background.